I don’t know about the rest of you, but when I think about technology, I think about toast. Toast has come a long way from it’s primordial beginnings as little more than slices of almost-burnt bread, and finally, we have a toaster that is worthy of everything that toast represents. 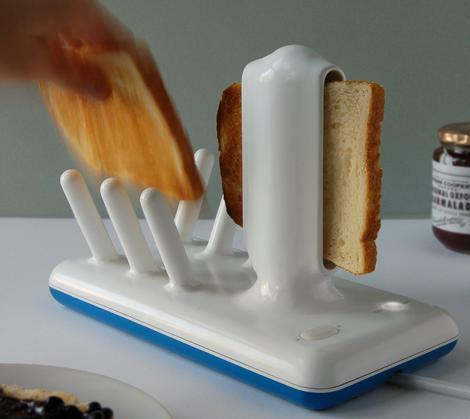 It’s called the Glide, and it works by passing slices of bread upright through heating elements and depositing them into a toast catcher on the other end. This highly visual method solves one of the most nerve-wracking elements of a conventional toaster experience: when exactly will the toast pop up, and how can I not always be startled when it does? Also, note that the Glide is made out of bone china, which is important, since we all know how metal toasters have the potential to become dangerous. From the designer: “This toaster is designed to engage the user, re-invigorating the social context of toasting by questioning everything about what we toast with today.” Um, what? The “social context” in which I toast is when I’m up late alone and I decide to make dinner out of Pop-Tarts and Eggo waffles. Lucky for me, the Glide’s toasting elements can adapt to toastables of differing thicknesses, so I can continue my unhealthy and socially isolating but oh so yummy toast lifestyle. The Glide’s creator has already been approached by manufacturers, so if we’re lucky, it’ll show up on our kitchen counters re-invigorating our social contexts sometime soon. I love toast as much as the next person, but I see a HUGE issue………. What about the bagel? That skilly little slot is not big enough for my morning garlic bagel (much like the minds of today’s societys skinny ideals of what women should look like). Let’s not forget the all important Bagel. Exactly, although I don’t know about garlic bagels (yuck)… but cinnamon raisin, now that’s what I need it for! Like standard toasters and this one, you have a safety issue with people sticking their fingers in, only with an adjustable-width toaster, users have a reason to do so. To prevent this, you could use hard flaps on the toast insertion and extraction points. The insertion point would remain unsafe, but the extraction point would be very difficult to open casually. Additionally, the flaps would indicate “inside” the device where it is not safe, and “outside” where it is. These flaps could automatically trip a switch to start toasting, leaving only one “light->dark” scalar that the user needs to control. What the hell is wrong with conventional modern toasters, anyway? If it’s not broken, don’t fix it. This thing looks more like a novelty item than anything. I’ve seen refrigerator magnets of toasters that probably work just as well as this overthought gadget. That looks really awesome! That toaster can also be used not only for toasting bread but for home decor too, because of it's unique design.